Grand Central Publishing, 9781455512874, 320pp. When America wakes up with personable and charming hosts like Robin Roberts and George Stephanopoulos, it's hard to imagine their show bookers having to guard a guest's hotel room all night to prevent rival shows from poaching. But that is just a glimpse of the intense reality revealed in this gripping look into the most competitive time slot in television. 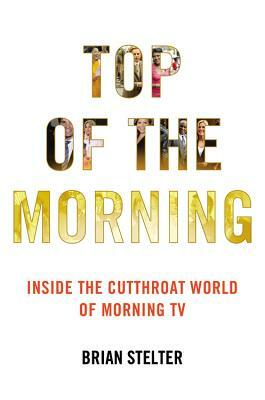 Featuring exclusive content about all the major players of the 2000s, TOP OF THE MORNING illuminates what it takes to win the AM -- when every single viewer counts, tons of jobs are on the line, and hundreds of millions of dollars are at stake. Stelter is behind the scenes as Ann Curry replaces Meredith Vieira on the Today show, only to be fired a year later in a fiasco that made national headlines. He's backstage as Good Morning America launches an attack to dethrone Today and end the longest consecutive winning streak in morning television history. And he's there as Roberts is diagnosed with a crippling disease -- on what should be the happiest day of her career. Brian Stelter is the senior media correspondent for CNN and host of the show Reliable Sources. He was previously a staff writer at the New York Times and was featured as a subject in the New York Times documentary Page One. Before joining the Times in 2007, he was the founder and editor of TVNewser, the pre-eminent blog about the television news industry, which was sold to MediaBistro in 2004.